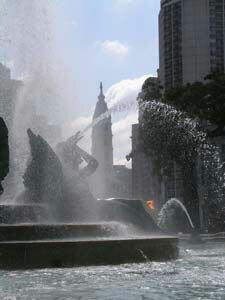 The Schuylkill River ends its journey winding through the City of Philadelphia, the fifth-largest city in the nation. Settled in 1682 by English gentleman William Penn as the capital of his new colony of Pennsylvania, Philadelphia quickly became the cultural, political, and financial center of the American colonies. When dissatisfaction with British taxation and rule in the American colonies reached a boiling point in the 1770s, delegates from each of the 13 colonies met in the Philadelphia to discuss their course of action. Throughout the spring and summer of 1776 the delegates met secretly in the Pennsylvania State House, now Independence Hall, to draft the Declaration of Independence, and formally sever political and financial ties with England. Eleven years later, after a long and costly war, many of the same men again met in Philadelphia to form a new government to rule the now independent nation. The Constitutional Convention selected Philadelphia to be the first capital of the new nation, and both Presidents Washington and Adams were sworn into office in Philadelphia. The City was also home to the First and Second Banks of the United States, the first Post Office, University, library, and volunteer fire company in the United States among other distinctions. In 1812 Philadelphia became the first city in North America, and only the second in the world to provide fresh drinking water to its citizens as a government service. The Watering Committee constructed the Fairmount Water Works along the banks of the Schuylkill River beginning in 1815 to pump water out of the river into a large reservoir high atop the “Fair Mount” where the Philadelphia Museum of Art sits today. The Water Works ceased its pumping operations in 1911 and today is an interpretive center operated by the Philadelphia Water Department that is an incredible place to learn about the history of this National Historic and Civil Engineering Landmark, water quality, pollution, public health, and wildlife. In the 1860s, the Fairmount Park Commission was chartered to protect the Schuylkill River as a source of drinking water. The Commission purchased thousands of acres along the river and throughout the City to prevent industrial development. The Fairmount Park system grew to encompass over 9,000 acres, one of the largest urban park systems in the nation. The Schuylkill River in Philadelphia is a heavily used recreational resource offering numerous activities for recreationalists of all types. Perhaps most famous is the rowing community that traces its origins to the 1830s. The stately late 19th-century boathouses along Kelly Drive are Philadelphia landmarks and are home to the nation’s oldest rowing clubs. Each year the Schuylkill Navy hosts numerous regattas along the Schuylkill, including the Dad Vail, the largest collegiate rowing event in the nation. The Schuylkill River Trail follows begins in Center City and hugs the river as it winds its way through the city on its way northward. East and West Fairmount Park offer numerous loop trails, active recreational opportunities, historic houses, and public art.